A couple of things come into play here as assumptions, the most important of which is that these fictional aliens are equivalent to any potential extraterrestrial biological entities (EBEs) that might actually exist. I’m not even talking about the fact that they’re all bipedal humanoids. 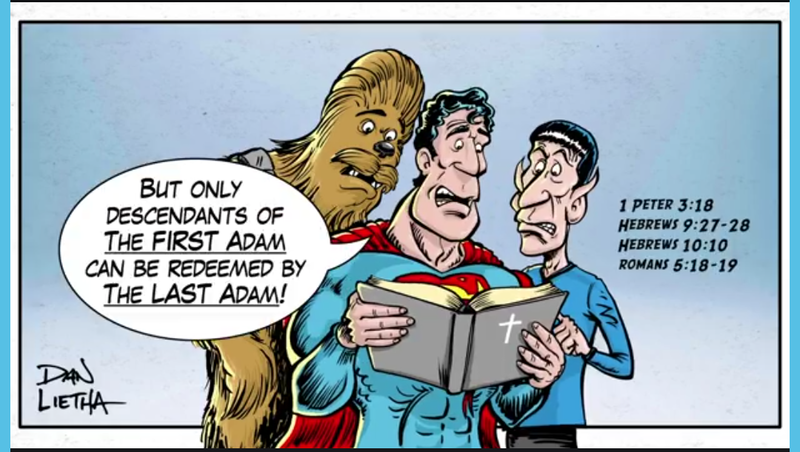 No, I’m talking about the fact that the fictional aliens presented in this comic strip are all sinners (Even the Man of Steel demonstrated his dark half in Superman III); but would real EBEs be sinners? 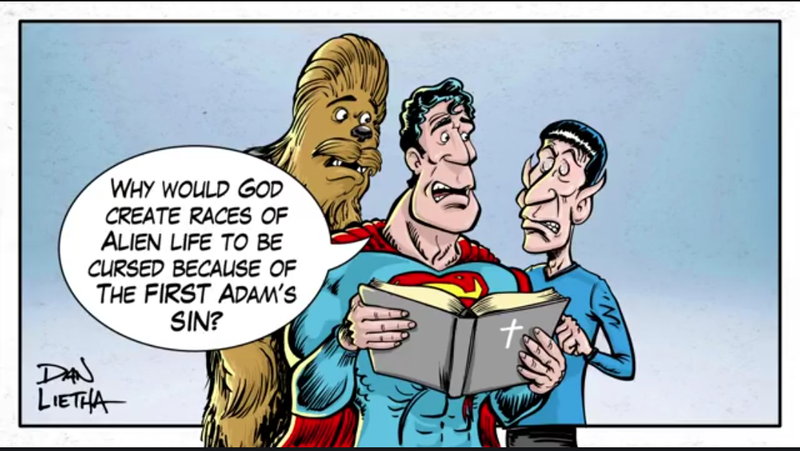 Because if real EBEs are spiritually unfallen, they don’t even need saved and this entire cartoon amounts to a straw man argument. Something to recall is that not all of creation is spiritually fallen. So far as we know, only mankind incurred the spiritual effects of the Fall. 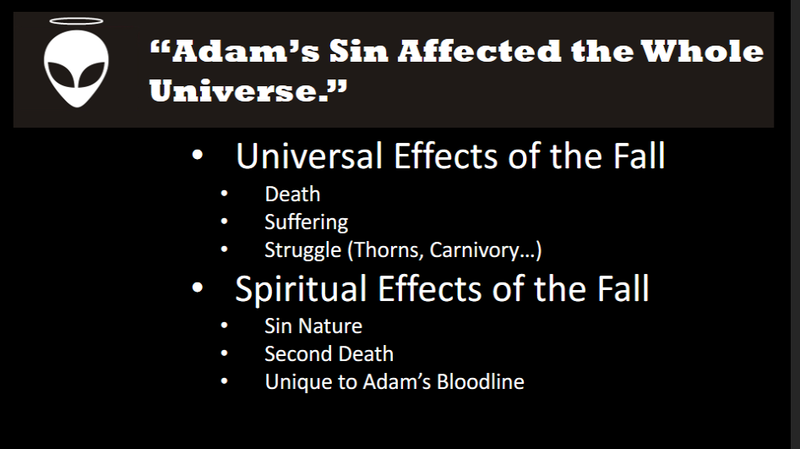 Adam’s sin affected the whole universe, but the spiritual effects were limited to Adam and Eve’s bloodline (which is why I refer to them as the sanguine effects of the Fall in my book, Strangers and Aliens). In other words, dogs and crickets might need redeemed from the universal effects of the Fall, but they don’t require a remedy for any of the spiritual effects of the Fall. 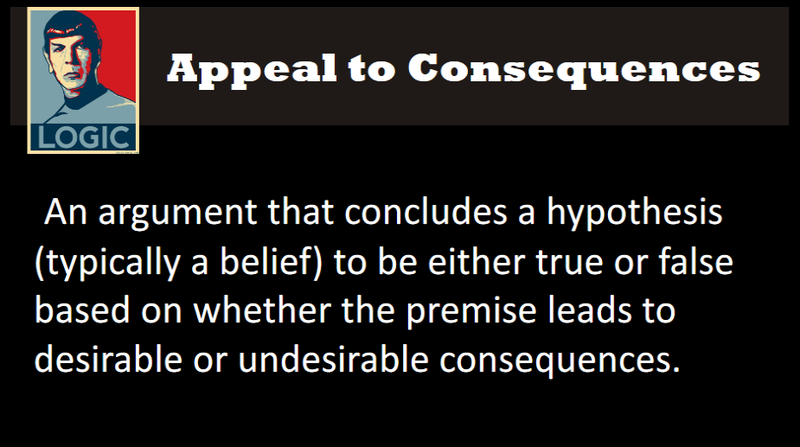 Dan Lietha and Answers in Genesis (and anyone else who uses this bad argument) is guilty of a logical leap (i.e., a non sequitur) in assuming intelligent EBEs must also be fallen sinners. Point in fact, angels are intelligent beings; sone are fallen, but it is evident from the timing of the Serpent’s temptation of Eve that they have fallen apart from Adam’s. Likewise angels did not incur the spiritual effects of the fall, so that the majority still remain unfallen. The point is that the state of the angelic hosts makes it evident that a presumption that all intelligent beings just have suffered the spiritual effects of the Fall does not follow. 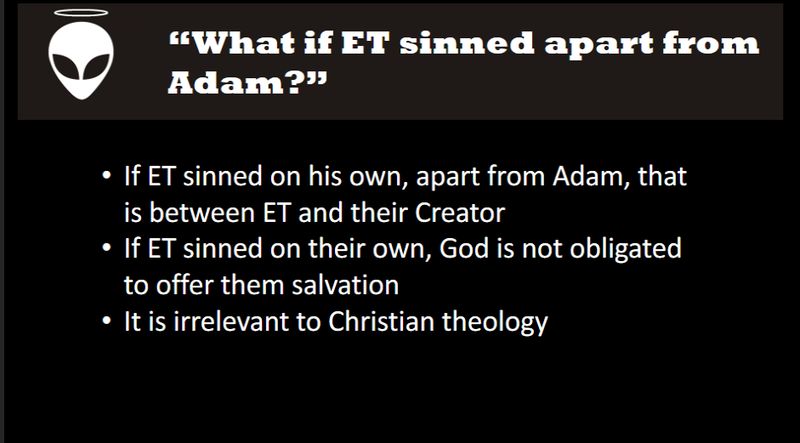 The question is whether they are spiritually fallen through Adam’s sin. 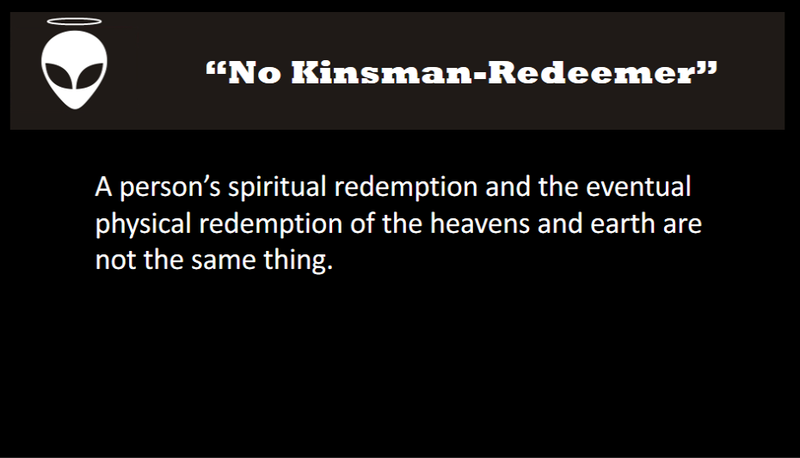 Only one of the verses Dan Lietha includes on his “redemption” slide really deals with salvation being only available to Adam’s bloodline. The preceding three all speak of Christ’s once for all crucifixion on the cross. 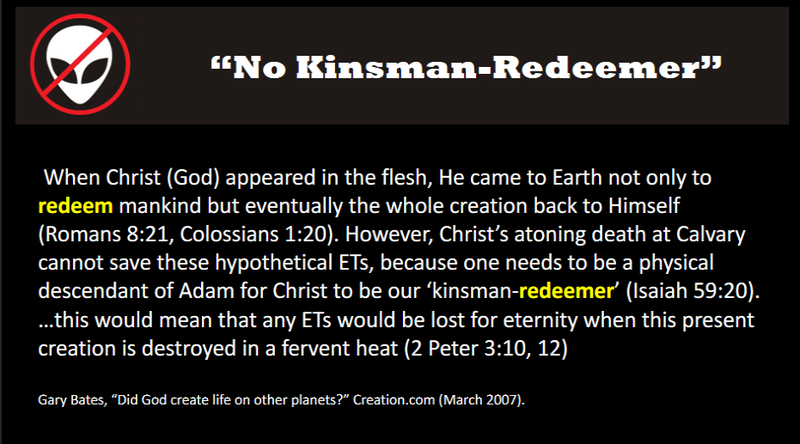 Since we require a kinsman-redeemer and Jesus only died for humans, the argument goes, aliens can’t be saved. Here are some further examples of this argument. In the wake of these leading questions, Dan Lietha’s cartoon ends with a proclamation that this idea that God would create aliens destined to exist in a fallen world with no hope of salvation is both illogical and unbiblical; however as we’ve already seen, Leitha’s cartoon argument isn’t doing too hot in the logic department. Gary Bates is of course the fellow who wrote Alien Intrusion: Ufos and the Evolution Connection. Yes, his book is filled with these same type of errors. My guess is that the movie version of his book will be just as bad. 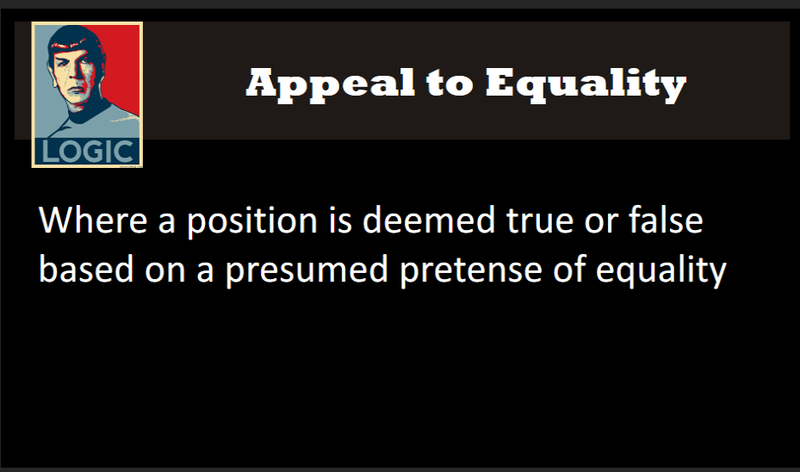 In any case, everyone using this particular argument is guilty of a logical fallacy known as an appeal to equality. 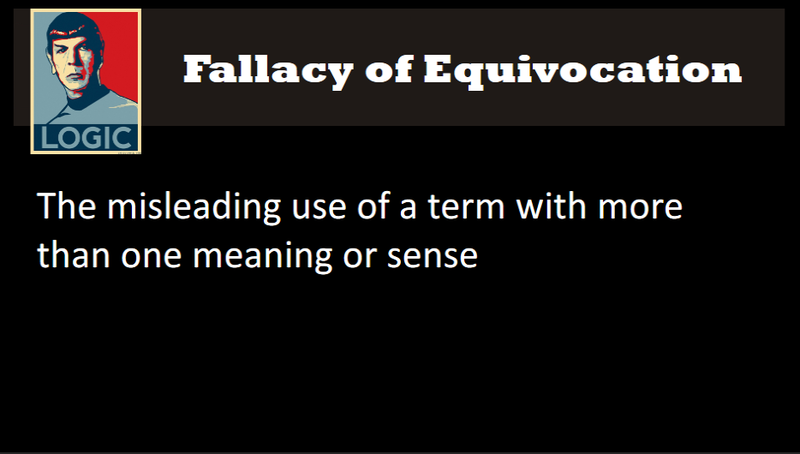 What makes Dr. Lisle’s error particularly painful to read is that he wrote a book on logical fallacies employed by evolutionists. Pity he couldn’t recognize his own special pleading. 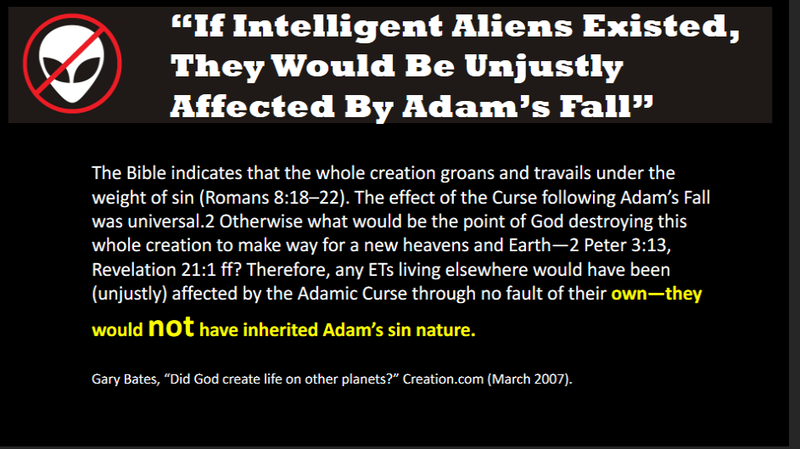 The fact us that the entire universe suffers from Adam’s sin. Animals suffer and die. Unfallen angels must bear the fallen state of the universe when they carry out God’s work here. 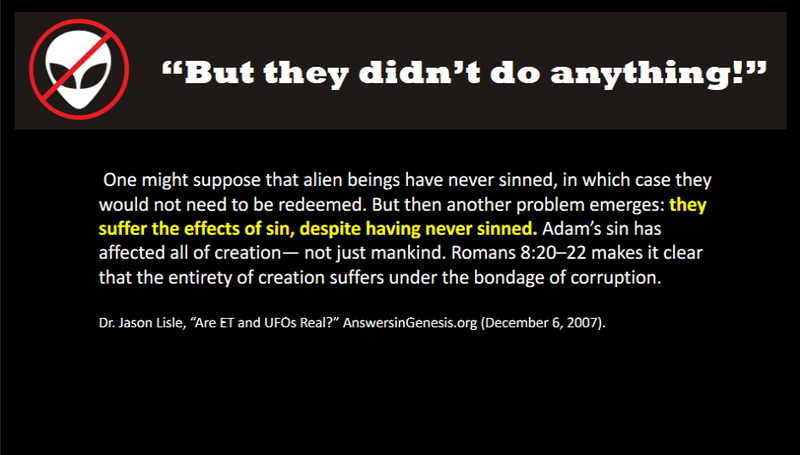 Why is it that we do not question God’s goodness and justice regarding the universal effects of the Fall unless someone brings up the subject of aliens?? 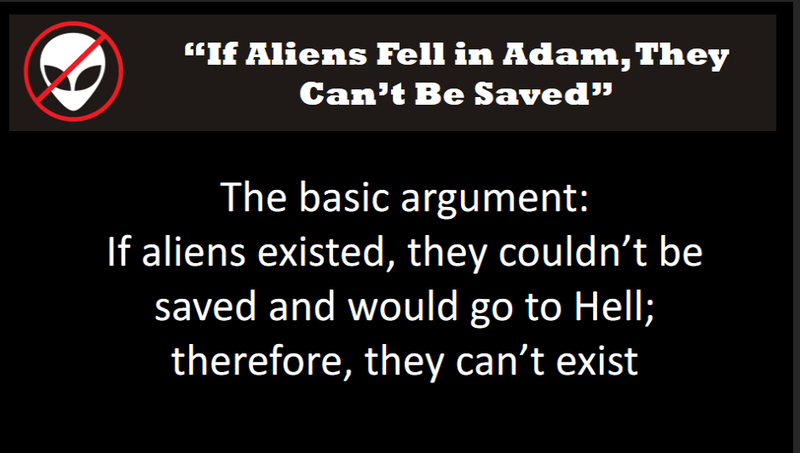 In any case, the argument being made is that fallen aliens would go to hell, therefore they don’t exist. That’s the argument. No, really. 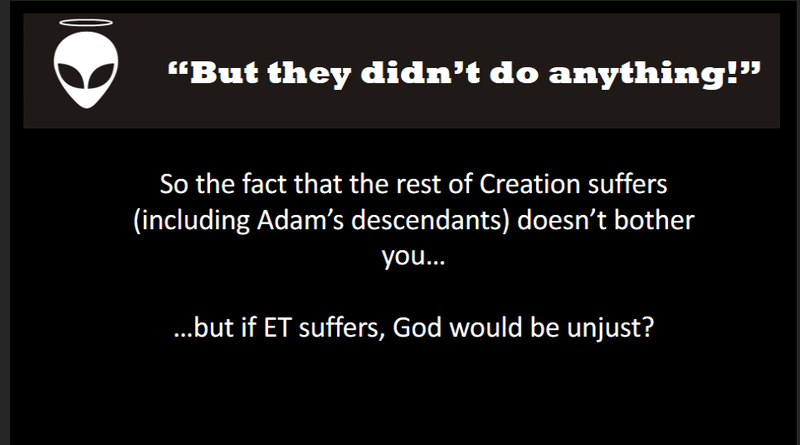 I should first point out that God is just, which is why some of my fellow creationists feel this argument is both justified and the death knell for the possibility of intelligent, moral extraterrestrial life. And I disagree with their assessment precisely also because God is just. 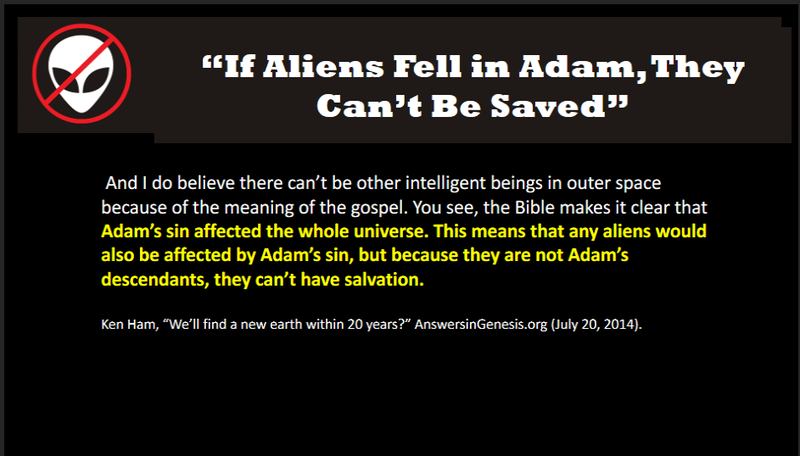 You see if aliens incurred the spiritual effects of the Fall, since they exist apart from Adam’s bloodline, their sin nature must have been imputed to them. If this is the case, then there is no logical, non-arbitrary reason why salvation by Grace alone through faith alone in Christ alone cannot also be imputed to them. 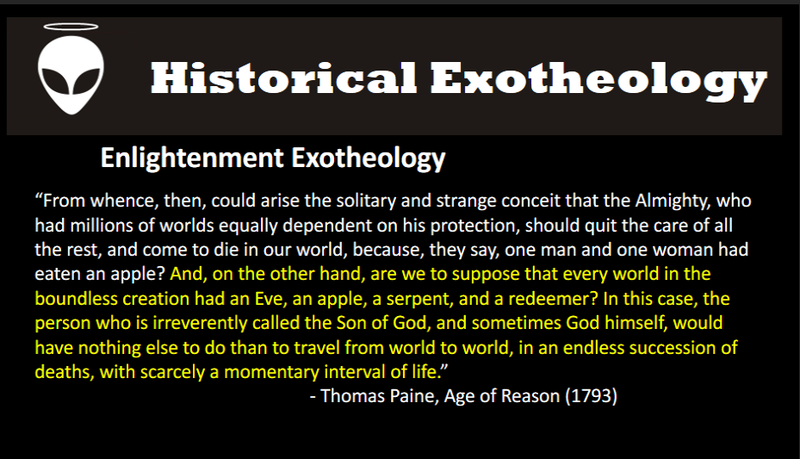 During the Enlightenment, Thomas Paine made an argument that alien life would require Christ to be incarnated and crucified on multiple worlds. 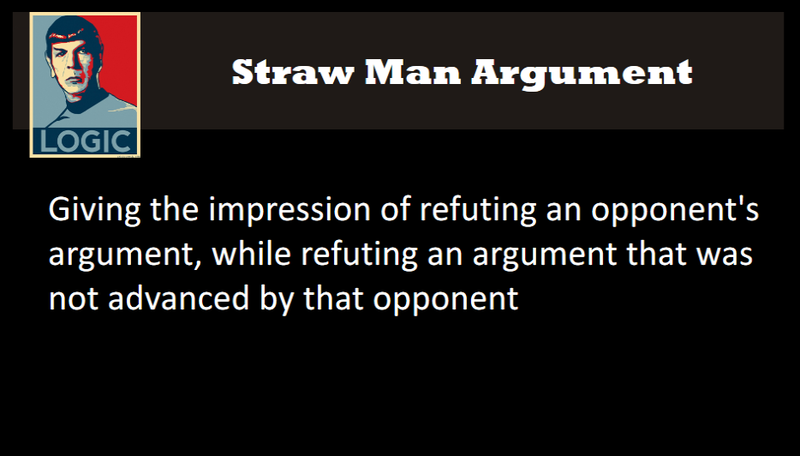 Being mindful if Christ’s once for all sacrifice, some creationists have also bought into this argument and declared that this makes alien life impossible, but it was a straw man argument then and it is a straw man argument now. As a point of irony, Paine (along with, one assumes, a good number of my fellow creationists) was unaware that his argument had been answered a long, long time ago. 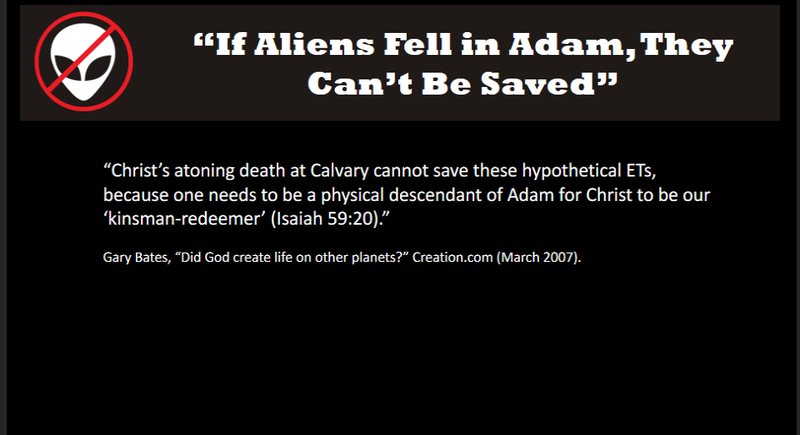 Christian apologists like William Vorilong had already realized that the fact that aliens would not be of Adam’s bloodline would make multiple incarnations on alien worlds unnecessary. 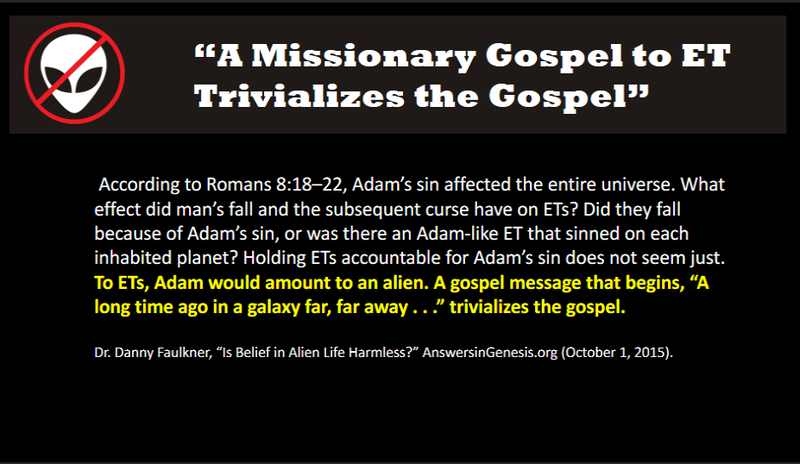 Again, this is because if aliens are fallen Adam, the spiritual effects of the Fall were imputed, meaning salvation through Christ’s work here on the cross could also be imputed to them. All that is required is special revelation and an appropriate response. God is certainly capable of special revelation. Now I am aware that at least one fellow creationist thinks that this idea trivialized the Gospel. With all due respect to Dr. Danny Faulkner, his argument is another example of special pleading. 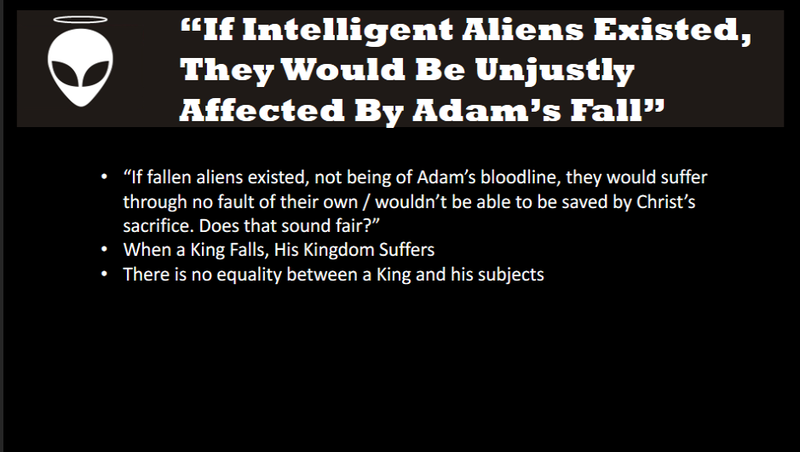 In any case, to suggest that the sanguine effects of the curse can be imputed apart from Adam’s bloodline but that salvation by the Last Adam’s sacrifice cannot also be imputed is to commit the fallacy of (you guessed it!) 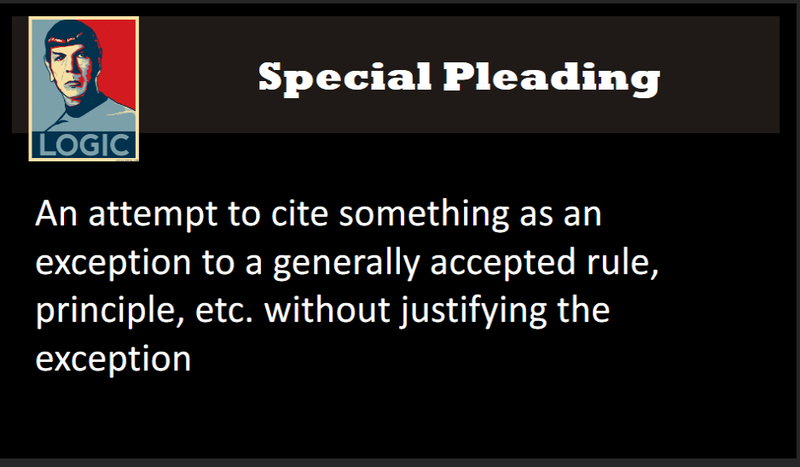 special pleading. 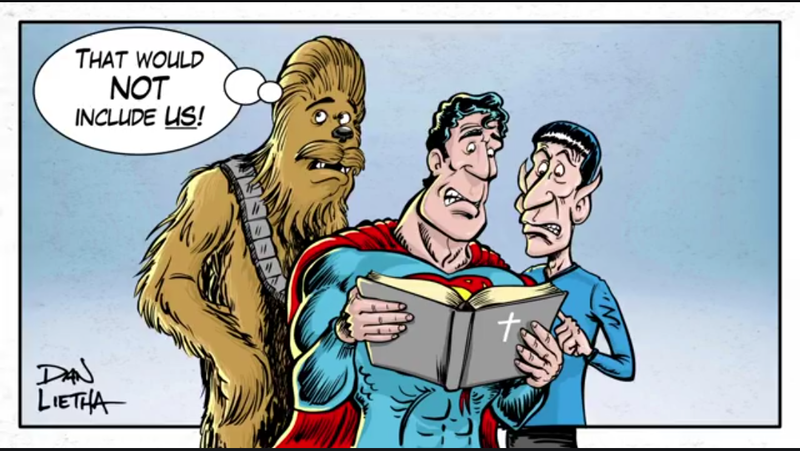 Unfortunately, it turns out that all attempts to make an argument that the possibility of extraterrestrial life is unbiblical ends up being based on logical fallacies like these. 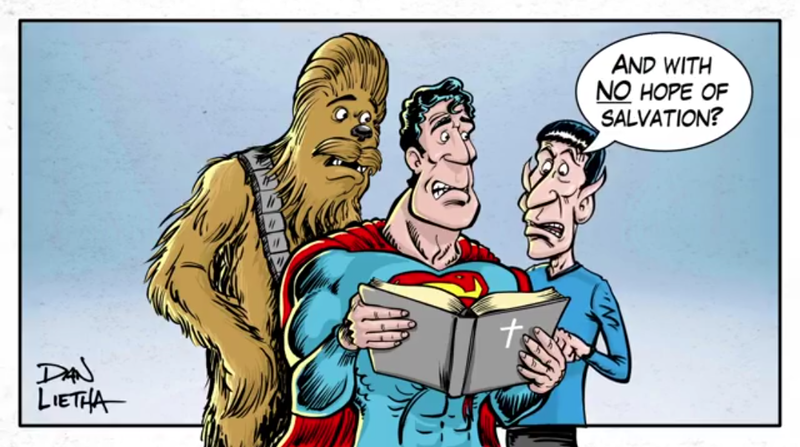 Rather than trying to make the Bible say things it doesn’t say, we should respect the fact that the Bible is silent on the subject of extraterrestrial life. Even if we find current arguments for extraterrestrial life unconvincing, it is unwise to be dogmatic about things that the Bible is silent on. My sincere hope is that Dan Lietha, Answers in Genesis and everyone else using such ill-advised arguments will begin re-examining their claims and return to a more tentative stance where the Scriptures are silent. You can also pick up a copy of Strangers and Aliens: A Christian Sci-fi Author Examines the Evidence for Extraterrestrial Life on Amazon or my author website. 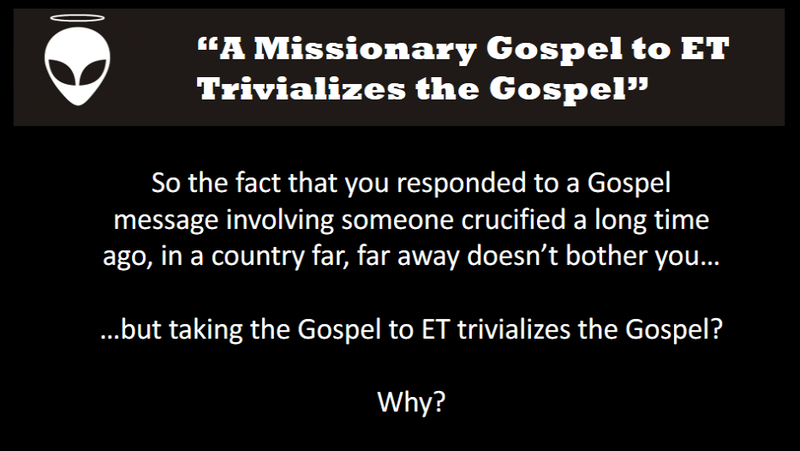 Note: This post was adapted from the presentation “Can ET Be Saved?” © 2017 Exotheology.org.